With so many options it was really hard to choose what to order. Thank goodness we don’t live too far so we can come back and try the rest of the menu. This was actually our second visit in the same week. We first came for the afternoon donuts, but today was all about brunch. To begin with, we had to try the coffees, which we heard were really good. I ordered the Matcha Latte on Bonsoy. I do like Matcha, but sometimes when I’ve ordered it, it’s been a bit bitter. I let the barista know that I like mine a bit on the sweeter side and she said she would put in a bit of extra honey, as sugar doesn’t sweeten the matcha as well. It was probably the best matcha drink I’ve ever had. Marco stuck to cappuccino, which he really enjoyed too. 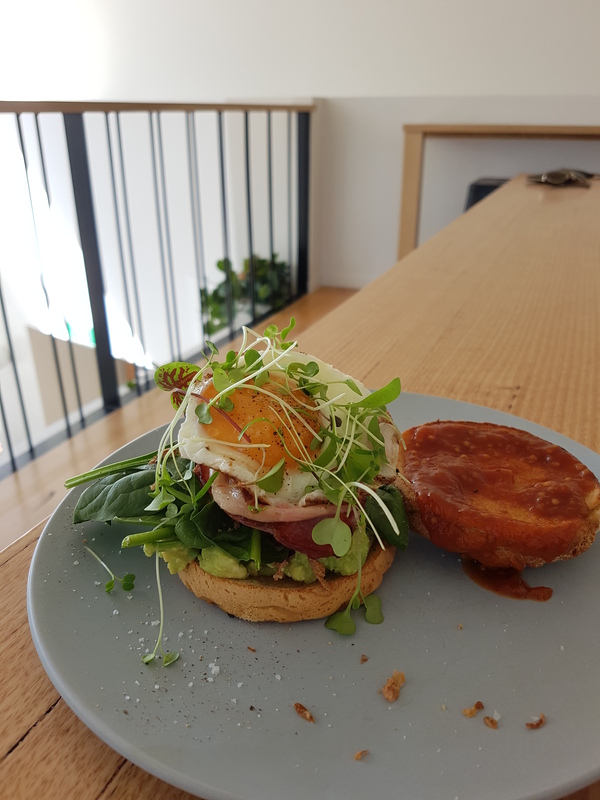 We weren’t really in the mood for our usual brunch order of avo on bread and a big breakfast. Yeah, it gets a bit boring. Luckily most of the dishes on the menu were things we hadn’t tried before. We decided to go with the quinoa buns (burgers). We ordered the Mushroom Bun and the Breakfast Bun. I was a bit concerned about the gluten free quinoa bun, not for me but for my picky companion. However, he didn’t even realise it was gluten-free so he was pretty impressed. His bun looked really delicious. I didn’t get to try it since he didn’t offer. He was really happy so I guess he forgot. He did try mine though and approved, which was amazing considering he hates mushroom. My mushroom bun was fantastic. I don’t often order mushroom burgers because they are usually really soggy, but the pattie was lightly crumbed, moist inside but not dripping wet. The bun was nice and soft and it was easy to forget it was gluten free. The fillings also were tasty and went well with the mushroom pattie. I definitely would come back for this burger. 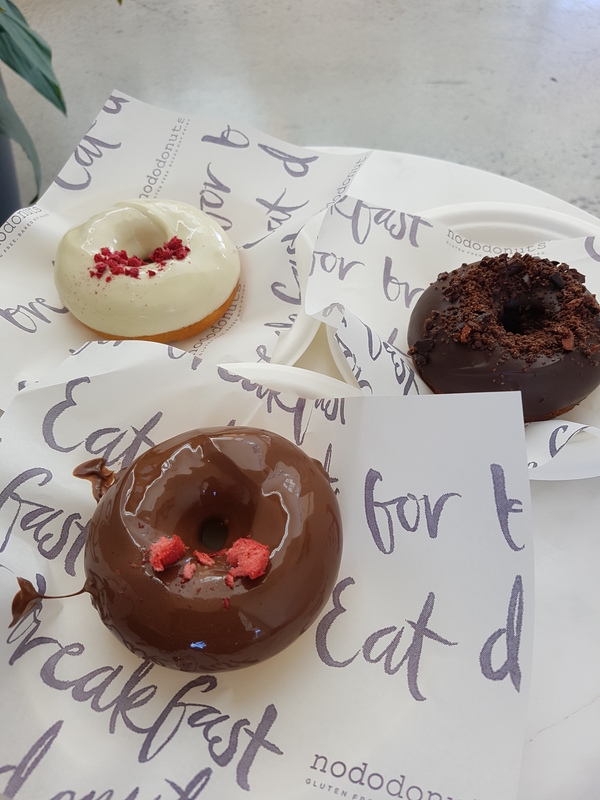 We couldn’t leave without trying the donuts again. Like I said, this was our second visit so we knew how good they were. We were pretty full from breakfast so we only got one to share. We ordered the Pumpkin Maple donut (GF, DF). It was perfectly soft and cake-like in texture. There was a hint of pumpkin and spices that left a pleasant after taste. The chocolate and gingery maple crumb were also spot on and complimented the pumpkin. On our first visit, these are the donuts we sampled. We tried the Raspberry White Chocolate (GF); Strawberry, Coconut & Hazelnut (GF); and Valrhona Beets (GF, DF). Octavia and I really liked the white chocolate, Marco preferred the Strawberry Chocolate. Probably our least favourite was the Valrhona, only because it was darker in comparison. It also is dairy free, which is usually my preference, but today I was naughty. So as you can probably tell I will be definitely visiting Nodo again. 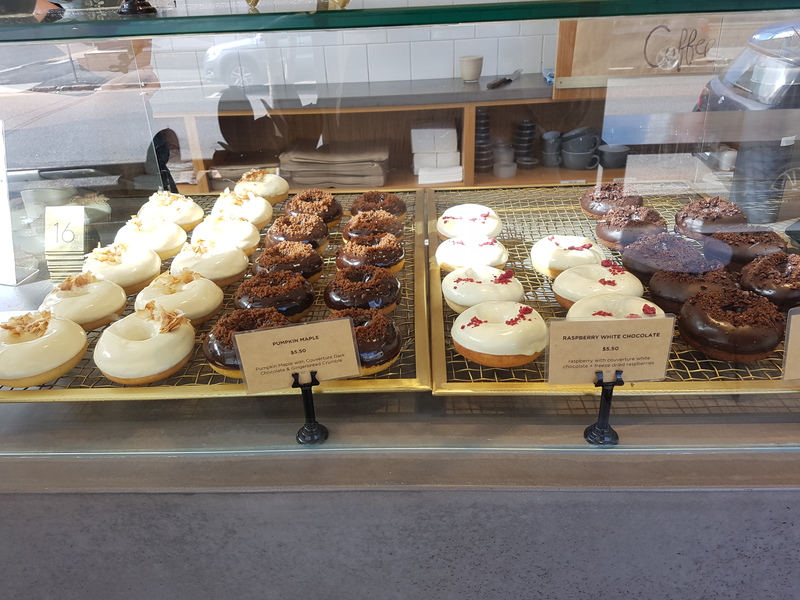 I still have a few of the baked donuts to try, as well as the raw donuts, the shakes and more savoury dishes on the menu…Can’t wait!